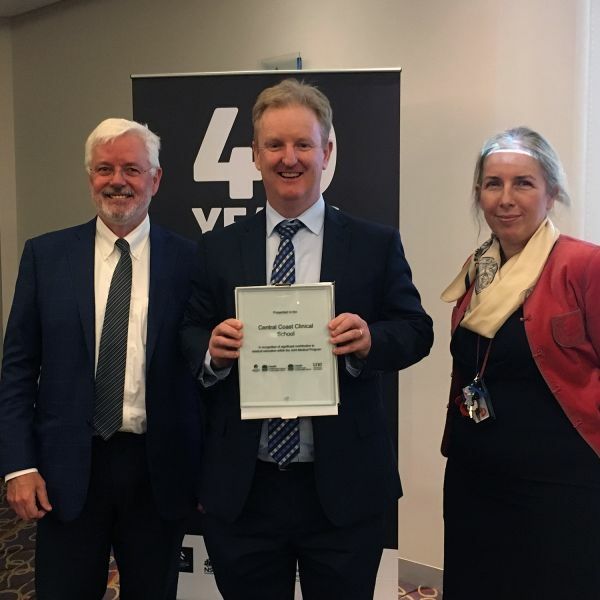 The University of Newcastle has celebrated its partnership with the Central Coast Local Health District (CCLHD) medical staff, acknowledging the important contribution they make in supporting the country’s next generation of doctors. University of Newcastle Dean of Medicine, Joint Medical Program, Professor Brian Kelly; Chief Executive, Central Coast Local Health District, Dr Andrew Montague and Clinical Dean, Central Coast Clinical School, Dr Amanda Dawson. In 2018, the University of Newcastle celebrates the 40th anniversary of medicine and the 10th year of its Joint Medical Program (JMP). As Australia’s only joint medical program, delivered through a unique partnership with the University of New England, Central Coast and Hunter New England Local Health Districts, it enables more than 1000 practising doctors with a variety of backgrounds to support students with hands-on, practical learning. To acknowledge the partnership and thank CCLHD medical staff for their ongoing support of UON medicine students, the University hosted an event at Gosford Golf Club on 9 August. Clinical Dean, Central Coast Clinical School, Dr Amanda Dawson said the University’s partnership with the Central Coast Local Health District meant medicine students could establish meaningful and productive networks with medical practitioners across the spectrum of clinical settings in rural, regional and urban locations. “Our unique partnership means students can access the best resources and educators. Learning is problem-based, and supported by early and broad clinical experience. “By graduation, our students have the knowledge and skills for contemporary and emergent medical practice, and are ready to play a key role in shaping future health care for individuals and communities. Dr Dawson said the thank you event for CCLHD medical staff was an important acknowledgement of the valuable role health staff played in supporting the University’s medicine students on their journey to becoming health professionals. “Many CCLHD medical staff were previous students of the JMP program and have liked it so much that they have stayed. This creates a strong sense of camaraderie and fellowship for our current students,” she said. Student numbers at the Central Coast Clinical School have increased 10 fold since 2004. In 2019 it will welcome an additional 40 students; and will be followed with the opening of the new Central Coast Medical School and Research Institute in 2020/2021, which will accommodate students from year one through to year five of the medicine degree. The new CCMS will have state-of-the-art technology and will be situated in a Health and Wellbeing Precinct on the Gosford Hospital Campus, together with the Central Coast Medical Research Institute, as a partnership of the CCLHD and UON.